Anti G-20 summit protestors rioted in downtown London but Scotland Yard has said that all violent protesters who attacked police and stormed a bank will be tracked down and prosecuted. 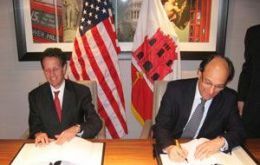 United States Department of the Treasury and the Government of Gibraltar announced in London in the framework of the G20 summit that the two countries have signed an agreement to allow for exchange of information on tax matters between the United States and Gibraltar, reports the Gibraltar Chronicle. 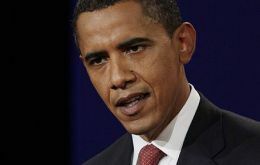 US President Barack Obama warned G20 leaders against giving in to fear and getting into a blame game, on the eve of the crunch summit to rescue the global economy. At a joint press conference with Gordon Brown, the president admitted that the US had some accounting to do over its responsibility for the crisis. But he also insisted that financial regulatory systems had been mismatched all around the world. France and Germany called for tougher regulation for the world's financial system during the first day of the G20 summit in London. 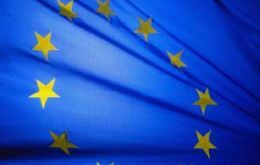 French President Nicolas Sarkozy, who has threatened to walk out of the meeting, said that new financial regulation was a non-negotiable goal. 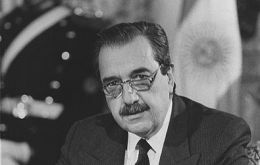 Raúl Alfonsín whose presidency marked the return of democracy to Argentina and became a beacon for change in the rest of Latinamerica scourged by an era of military dictatorships, died Tuesday evening. United States President Barack Obama is in the United Kingdom for his first major foreign trip since taking office in January. In London he is to attend the G20 summit of the world’s 20 major economies representing 85% of global GDP, which is hosted by British Prime Minister Gordon Brown. 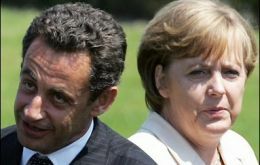 The two will have breakfast talks in Downing Street on Wednesday followed by meetings with other world leaders. South American leaders underscored the importance of economic and political ties with the Arab world in a summit meeting with their Arab counterparts in Qatar. 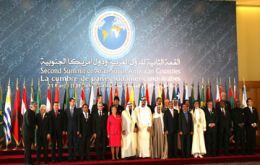 Tuesday's meeting, the second Arab-South American summit, in Doha, followed the conclusion of the Arab League conference in the city. Britain's naval bases around the world should be put under the control of the European Union, according to a report commissioned by the Brussels Parliament and which was leaked to the British press this week. 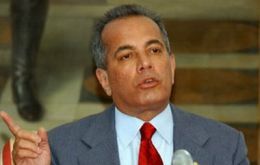 Venezuelan opposition leader Manuel Rosales, under investigation for corruption, has gone into hiding to escape alleged persecution by President Hugo Chavez, his party said on Tuesday. Venezuela is estimated to have spent 220 billion US dollars from its oil and gas revenue in investments, subsidies and donations to 14 “allied” countries between 2005 and 2009, according to Centro de Investigaciones Economicas, a Caribbean think-tank.